Problem: A street rod owner bought an older vehicle with 100,300 miles on the engine. The mileage is mostly city mileage. There has never been any work done on the engine. The owner says that the engine is hard starting and has a tendency to run very rough. After running for awhile, the engine runs okay. What could be the problem? Solution: An engine that has this many miles on it, especially from city mileage, could have a significant amount of carbon buildup inside the intake manifold near and on the valves as shown to the left. When the engine is first started up, the carbon has a tendency to absorb some of the fuel before it gets to the combustion chamber. Since some of the fuel is being absorbed it is not available for combustion. This causes the engine to run rough immediately after starting. 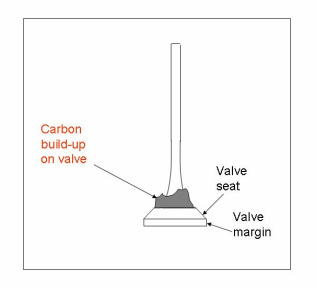 The only way to fix the problem is to remove the carbon on the intake valves. This can be done by removing the head and cleaning the carbon off the intake valves. When the cylinder heads are removed, make sure to clean all valves, grind the valve faces, and grind the valve seats before re-installation.